In the 80’s, Mexico undertook important efforts towards its economic and commercial opening, a process that included the consolidation and diversification of its exports. This actions placed the country among the most important exporters in the world. According to Banco de México, exports of Mexican goods and services accounted for almost USD 386 billion, representing 37.9% of the country’s GDP. 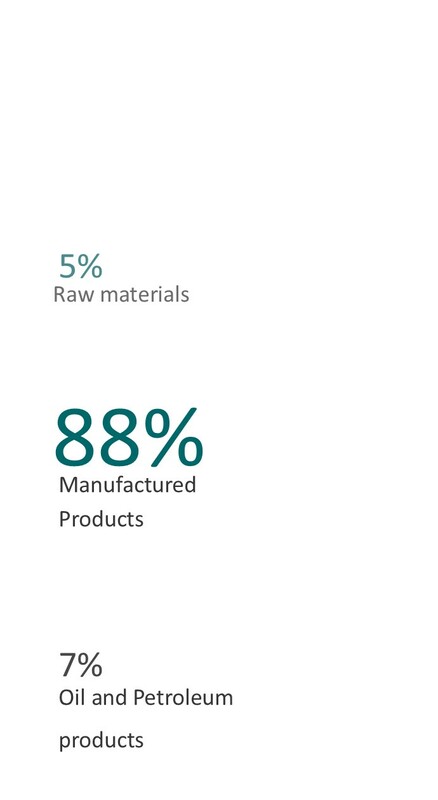 Mexican manufacturing activities are totally integrated to global value chains. According to the World Trade Statistical Review 2017, conducted by the World Trade Organization (WTO), in 2017 Mexico ranked 13th place as exporter as well as importer. The International Monetary Fund expects a sustained growth of Mexican exports of goods and services for the following years. In 2017, Mexican exports represented 42% of Latin American total exports, and consolidated as the leader exporter of the region.. It is important to mention that Mexico stood for more than 50% of the region’s exports of manufactures involving intermediate and advanced technologies. Actually, Mexico has a solid and mature industry, especially in sectors such as metal mechanic, aerospace, automotive, electrical and electronic. As a result, Mexican exports of industrialized goods, particularly those with high added value, have shown an important growth compared with oil related products and raw materials. In addition, there had been supports in public policies and programs that foster the integration of Mexican companies to global value chains. Mexico has signed 11 Free Trade Agreements with 46 countries that provide preferred access to Mexican goods and services to the most important markets in the world. The purchase power of this markets represent almost 60% of the gross world product, and more than 1.2 billion people. ProMéxico, Global Value Chains: A Model for the Integration of Mexican Companies, . Note: On November 30th, 2018, the United States-Mexico-Canada Agreement was signed, and is currently pending to be ratified by each country’s congress. The Pacific Alliance is a trade bloc formed by Mexico, Chile, Colombia and Peru, and is a platform to encourage economic cooperation with the Asia-Pacific region. While seeking the integration of these Latin American economies, this agreement gives Mexico a new alternative for its trade liberalization with Latin America by establishing new commercial and investment ties with the members of the alliance. This bloc represents 39% of Latin American GDP, 52% of its trade and 45% of its foreign investment flows. 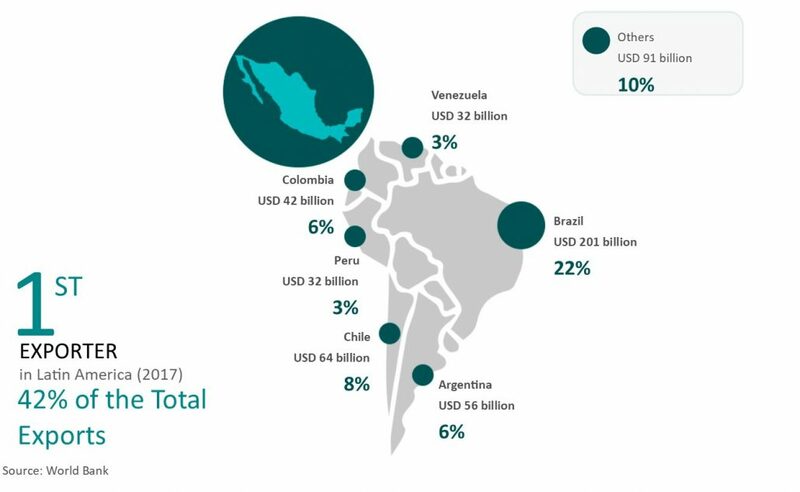 Likewise, the Pacific Alliance represents a population of over 225 million people with an average per capita GDP of 16,759 USD (in terms of purchasing power). Pacific Alliance (Institutional Web Page), 2016. The Comprehensive and Progressive Agreement for Trans-Pacific Partnership (CPTPP) Mexico. It has been ratified by Mexico and will start on December 30th, 2018. This agreement is part of a long term strategy designed to complement the benefits of the North America Free Trade Agreement, as well as reinforce the Pacific Alliance. Once ratified by its members, it is foreseen that this partnership will open new business, investment and job opportunities to Mexican companies in six new markets. In addition to these agreements, Mexico has signed Economic Complementation Agreements, Partial Scope Agreements, and Cooperation Agreements that place it as one of the most open countries in the world. For more information, please refer to the Trade and Investement Section of the Ministry of Economy (Secretaría de Economía).